Hello everyone, and a very happy Monday to all! I hope you all had a great weekend (I spent my Friday night sobbing in the theater watching Toy Story 3)! If you didn’t get a chance to see Toy Story 3 this weekend, please make time to see it. People have been saying that it’s even better than the first one…which I don’t necessarily agree with…but it’s definitely right up there. If you’ve grown up with Woody, Buzz, and the gang, you cannot miss seeing this. Trust me…it’s just the closure you’re looking for. And bring Kleenex. Lots of it. OKAY, anyway…I felt like embracing my inner baker this weekend and whipped up a batch of red velvet cupcakes. These are a no-miss. They’re super easy to make and are substantial enough to hold that intense frosting. 1. Preheat the oven to 350 degrees F. Line 2 (12-cup) muffin pans with cupcake papers. 2. In a medium mixing bowl, sift together the flour, sugar, baking soda, salt, and cocoa powder. In a large bowl gently beat together the oil, buttermilk, eggs, food coloring, vinegar, and vanilla with a handheld electric mixer. Add the sifted dry ingredients to the wet and mix until smooth and thoroughly combined. 3. Divide the batter evenly among the cupcake tins about 2/3 filled. Bake in oven for about 20 to 22 minutes, turning the pans once, half way through. Test the cupcakes with a toothpick for doneness. Remove from oven and cool completely before frosting. 4. In a large mixing bowl, beat the cream cheese, butter and vanilla together until smooth. Add the sugar and on low speed, beat until incorporated. Increase the speed to high and mix until very light and fluffy. 5. Garnish with chopped pecans and a fresh raspberry or strawberry. Frost the cupcakes with a butter knife or pipe it on with a big star tip. You could also put the frosting in a Ziplock bag and snip off a corner to make a disposable easy-to-use pipe bag. If you’re not a big fan of cream cheese frosting (like myself), you can make the cupcakes and dust them with powdered sugar. To create shapes, use a small cookie cutter and cover one side with plastic wrap or aluminum foil and place the other side face down on the cupcake. Sprinkle powdered sugar on top. Remove the cookie cutter to reveal your shape outlined in powdered sugar and tah-dah! You have an elegant cupcake. I made these for a baby shower once and used the powered sugar instead of the frosting…partly because they travel better and I don’t have to refrigerate them. I tied a ribbon around the cupcake and called it a day. What a beautiful cupcake! I love this recipe. Thanks for sharing. Thanks for the comment. 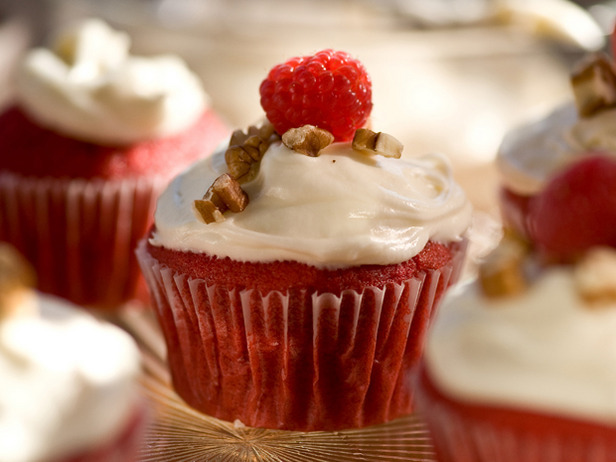 The recipe is delicious and if you like red velvet, you won’t be disappointed!